On November, 19th RABBIT EYE MOVEMENT is going to open the doors for UPTOWN DANNY – a tattooist, gaffiti writer and illustrator, based in Hamburg, Germany, who merges his artistry for the very first time in his upcoming solo show in Vienna. 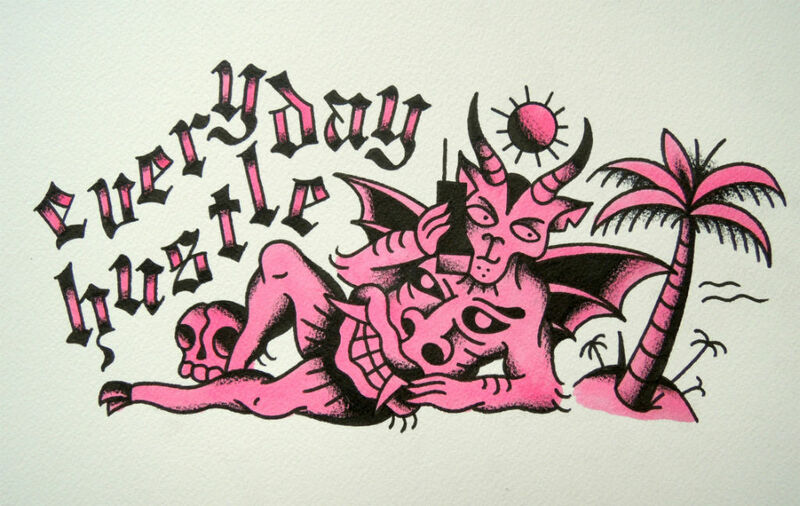 ”Everyday Hustle” is a collection of pieces, which follow the style of so called ”tattoo flashes” – sheets of paper, that have been a consistent part of the tattooing scene for the last century. The displayed watercolour and ink paintings show several tattoo motives and give an exclusive overview of the art work of UPTOWN DANNY. ”Everyday Hustle” is not only a slogan, but also the lifestyle and the concept, the artist has been dealing with throughout his entire career. 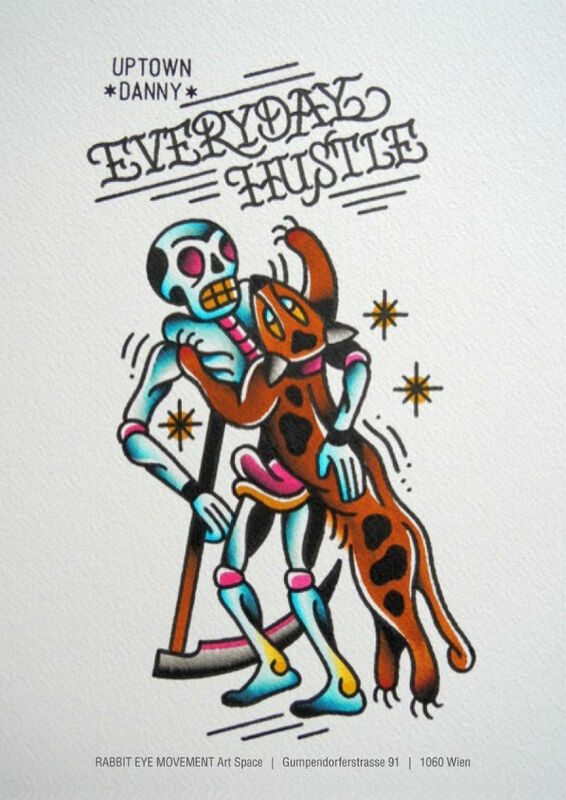 Mainly playing with classical tattoo subjects, UPTOWN DANNY captures his personal appreciation of the everyday hustle. With placing his pieces side by side in a rather loose way, the artist sets a focus on the contrasts between motives, that deal with life and death and puts them into a new context. Inspired by influences from several tendences – like Hip Hop, Graffiti and Comic – UPTOWN DANNY picks up the everyday hustle with conceiving it as a term, that is probably one of the most up-to-date phrases of our society. UPTOWN DANNY was born in 1983 and started painting Graffiti in 2000. His growing interest for skin art shaped his artistic development and initiated his current profession. Since June 2013, UPTOWN DANNY works as an apprentice for ”Alte Liebe Tätowierungen” in Hamburg, Germany. In the course of the exhibition, UPTOWN DANNY is available for tattoo appointments from November 9th -13th at Vienna Electric Tattoo. Don’t hesitate to send your requests to office@rabbiteyemovement and fix your date.